Birmingham’s Frank “Doc” Adams has led an extraordinary musical life. As a teen, he played saxophone with Sun Ra’s early orchestra and later worked with Duke Ellington’s band. In Doc: The Story of a Birmingham Jazz Man, the 85-year-old Adams shares an intimately in-depth narrative of his life-long love affair playing and teaching music. Loaded with barely restrained enthusiasm, his voice leaps off the page with wonder and exhilaration as he tells of pursuing and finding his dream. As a storyteller, he’s every bit as entertaining as the magnificent notes he coaxes from his sax and clarinet. Adams co-wrote the book with Birmingham schoolteacher and writer Burgin Mathews, though Mathews insists in the Introduction that his contributions mostly involved transcribing more than 100 cassettes spanning two years interviewing Adams. Mathews then immersed himself in editorial duties, determined that Doc Adams’ story be told by the musician himself in his own unique voice. 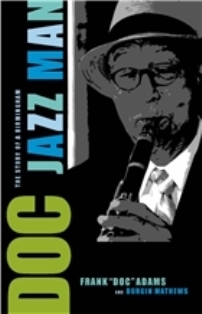 Mathews refers to the book as an “oral history: of memory, observation, impression, and storytelling” with an emphasis on Doc Adam’s “rhythm, style, and energy.” It was also vital to the co-author that the history of Birmingham jazz be shared at long last. Adams hailed from a prominent family. His father, Oscar Adams Sr., published The Birmingham Reporter, and from 1918 to 1946 he was the only black writer at the Birmingham News to have his own column about black life in the city, titled What Negroes Are Doing. Adam’s childhood is recounted with excitement, such as the story of Godpa Taylor, a master concert pianist who brought classical and ragtime styles into black families’ homes with free concerts for those who owned pianos. Neighbors filled living rooms for the rare opportunity to hear piano concertos. While in high school, Doc Adams began playing with the legendary Sun Ra (then also known as Herman “Sonny” Blount). Adams recalls Sun Ra’s odd habits: “Everything was a mystery about him. We never heard of him eating any food—he survived on grapefruit.” He tells of Sun Ra’s opinion that whites were his brothers “but some of them don’t know it yet.” He also regales with wild anecdotes of Sun Ra intimidating police officers. The cops would threaten Sun Ra when he wore his Egyptian robes and oddball hats in public. He would simply tell the police that he was from Mars and would paralyze them if they laid a hand on him. Among Sun Ra’s philosophies was an Adams’ favorite: “I was born with x-ray ears; I can hear all these things you humans can’t hear yet.” When Adams graduated from Parker Industrial High in 1945, Sun Ra wrote a letter of recommendation to get Adams accepted into Howard University. It was while at Howard that Adams found work with Duke Ellington’s orchestra. Adams was clearly impressed with Ellington’s sense of style, amazed that his traveling entourage included a bus just for Duke’s wardrobe alone. When visiting Birmingham on holidays while in college, Adams played at the Birmingham Country Club with local legendary bassist Cleve Eaton’s sister, who played piano. Years later, Adams would accompany the immortal Howlin’ Wolf at the country club at a dance for Mountain Brook teens who loved blues. It was around this time that he formed his own combo, Frank “Mr. Sax” Adams and His Band. Ed Reynolds is a writer living in Birmingham.